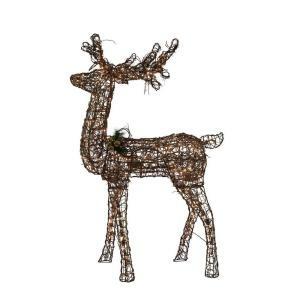 Home Accents Holiday 60 in. Grapevine Standing Deer with Animation PPPA LOCAL, Avi Depot=Much More Value For Your Money! FEW OF THE LIGHTS ARE OUT-CAN BE FIXED WITH ANOTHER BULB HARNESS-SELL AS USED! The majestic 60 in. Grapevine Standing Deer is a great traditional yard decor. This Deer is made with a sturdy metal frame and wrapped in a brown PVC grapevine looking material giving it the authentic look it needs. The head moves from side to side for the animated look of a real deer.